Special thanks to author Tim Brady for permission to reprint. In 1932, a 37-year-old engineer employed by the Standard Oil Company of California (Socal) made a habit of climbing the highest point on the island of Bahrain, about 20 miles across the Persian Gulf from the Kingdom of Saudi Arabia. From that hilltop, he stared at the topography of the mainland, over the blue-green waters of the gulf. There, Fred Davies (B.S. ’16), a University of Minnesota graduate in mining, saw a landscape similar to the one that he was standing on. In the distance, he could see a cluster of hills forming a dome above the countryside. Davies had just drilled the first successful oil well in Bahrain through similar terrain. Now his training, experience, and instincts told him that there was more oil to be had across the water—much more—in those hills on the other side of the flat shoreline. In fact, he was confident enough in that assessment to advise his employers that they ought to be here, in the heart of Arabia, where no other oil company in the world had yet drilled. It is no exaggeration to say that all of the momentous history that has subsequently linked the United States to the Middle East began with that appraisal. From it stemmed a series of events that brought U.S. oil companies to Saudi Arabia to begin extracting the single largest petroleum deposit in the world. From those wells have flowed billions of barrels of oil, trillions of dollars in commerce, and a steady stream of turmoil. Fred Davies did not disappear from the story with those sightings. In fact, his work in Saudi Arabia, and at home in the United States for Socal (at his suggestion, the company name would be changed in the 1940s, to the Arab-American Company, Aramco), would make Davies one of the major figures in the early history of Saudi Arabian oil. From his days in the early 1930s as a “hunch and slog” prospector for oil in Bahrain, to his retirement in 1959, as chairman of the board of Aramco, the largest producer of crude oil in the world, Davies was an integral player in the world of oil discovery and development. Born in Aberdeen, South Dakota, Fred Davies was raised primarily in north Minneapolis, one of five boys, whose father, Ralph, worked in the grain business in the city. 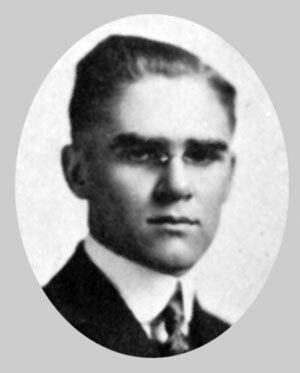 The young Davies was tall, rangy, and handsome and earned the nickname “Slim” while studying engineering in the School of Mines at the University of Minnesota. Davies worked for the Anaconda Copper Company for a year after college, did a hitch in the military in World War I, working in a chemical warfare unit, and wound up employed by Standard Oil of California in 1922. There he looked for oil in the Rocky Mountains until he got the call to head to the Middle East. After overseeing the drilling of that first well in Bahrain, and imagining the possibilities in Saudi Arabia, Davies made his first foray across the gulf waters to the mainland in the spring of 1932. At the time, Saudi Arabia was just emerging as a modern nation. The Bedouin tribes, which had dominated the region for centuries, had been consolidated under the leadership of King Ibn Saud and a monarchy, whose territory stretched from the Red Sea in the west to the Persian Gulf in the east, was formed. It was the heart of the ancient land known as Arabia and held the two cities most sacred to Muslims all over the world: Mecca, where the Prophet Muhammad was born; and Medina, where the Prophet had died. Because of its importance as the religious center of Islam, Saudi Arabia was and remains a special land for all the world’s Muslims. In the early 1930s, King Saud was strapped for funds with which to govern his new nation and looked to the West for support through the sale of oil concessions. Historically, Britain had been the one western power that had dominated the pursuit of oil in the Middle East, but its concessions and reserves had come from Iraq and Iran. It had never explored the interior of the Arabian peninsula for oil. Though it seems hard to imagine today, there were questions whether oil even existed beneath these desert lands. Aramco officials in Saudi Arabia. The British were dealing with a number of economic and diplomatic difficulties in the wake of World War I. Among them was their effort at maintaining a colonial empire under reduced circumstances. As a nation and economic power, Great Britain simply didn’t have the resources it once had, and the upshot for King Saud was that Britain’s interest in Arab oil exploration was surprisingly tepid. The United States was a latecomer to the pursuit of Middle Eastern oil, but it jumped into the fray in the late 1920s. Socal had tried, with little success, to find oil in Mexico, Venezuela, Colombia, Ecuador, Argentina, the Philippines, and Alaska. Some within the company were less than enthusiastic about the prospects for oil in the Persian Gulf. These same skeptics viewed the exploration in even dimmer light as the Great Depression swept over the globe and a costly hunt for crude in Arabia seemed like an extravagance. Oil seekers within the company won out over its accountants, however, and Socal became the first American oil business to send explorers to the Middle East. Davies was the man picked to lead the crew, and Bahrain was the first site for drilling. After his successes there, Davies crossed into Saudi Arabia with the hope of talking to Ibn Saud about the possibility of exploring that dome of hills near the gulf coast for oil. But he failed to get an audience with the king and headed back to the United States empty-handed. Ibn Saud’s need for cash remained, British interest in the region’s oil remained cool, and Davies, back in the States, continued to lobby for the exploration of oil in Saudi Arabia. 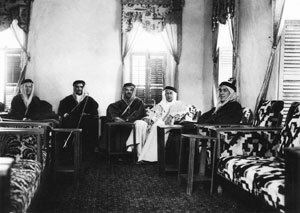 Two new representatives of Socal were sent to the Middle East and won an audience with Saud in 1933. Through these emissaries, Socal was able to sign an agreement to begin the process of looking for oil in eastern Saudi Arabia. By 1934, Fred Davies was back in Bahrain. A year later, he was in Saudi Arabia, serving as camp boss in the first American effort at digging oil wells in those same hills that he’d spied three years earlier, now called the Damman Dome. Davies from the 1916 Gopher yearbook. The agreement signed between Socal and the Saudis made patently clear that the Americans were in Arabia at the invitation of the Saudis and would adhere to the customs of the people and the land. That meant, among other restrictions, alcohol was strictly forbidden and consorting in any fashion with the women of Saudi Arabia was a crime punishable by death. In the eyes of the Saudis, the Americans were infidels, working in their lands at their own invitation and for Arab profit. Into these circumstances came a group of roughnecks and wildcatters from Dust Bowl America accustomed to working in the oil fields of Texas, Oklahoma, and California. Cultural sensitivity was hardly their forte. Perhaps not surprisingly, all of the powers concerned felt it was best for contact between Arabs and Americans to be as limited as possible. Though Saudis provided much of the labor at the drilling sites, the camps themselves were isolated and interaction between Americans and Saudis was otherwise strictly limited. Davies’s job was to make all of this work and to produce oil. He had the right, no-nonsense sensibility for the task. “Davies was not a terribly warm and chummy guy,” wrote an Aramco colleague many years later, “but he was enormously respected by government officials and employees alike.” Another co-worker said that he was “hard working, smart, imaginative, honest” and “concerned about people.” Also, a little moody, said this friend, and a quick-tempered. No doubt working on the Damman Dome tested Davies’s patience. Aside from the cultural difficulties, the desert climate was as extreme as any on Earth. Temperatures climbed quickly and easily into the 120s and sandstorms were a frequent hazard. To top it all off, oil did not immediately pour from the sands of Saudi Arabia. won him the respect of foreign peoples". In 1935, Dammam No. 1 was drilled in the dome and produced a modest amount of crude at 2,300 feet. A few months later, a second well, Damman No. 2, brought in oil at 2,100 feet. It began flowing at a rate of 3,800 barrels a day, which was a sufficiently exciting return for Standard Oil Company officials in San Francisco to send air conditioning units to the camp in Saudi Arabia as a sign of commitment to the project. The company also quickly ordered drilling on wells No. 3, 4, 5, and 6. But soon after Davies and the crew began working on Damman No. 7 in December of 1936, enthusiasm eroded. Oil from each of the first six wells had turned into trickles and it would take until October for No. 7 to produce any oil at all—and that was at a depth of more than 3,600 feet. 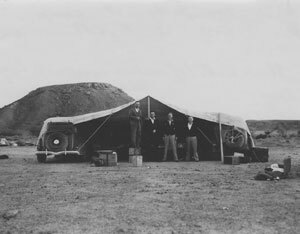 In early 1938, Davies and the chief geologist on the site were called back to San Francisco to explain to the honchos at Standard why it made sense to remain in the sands of Saudi Arabia. The gusher came in while they were away. In March 1938, at a depth of more than 4,700 feet, Damman No. 7 started producing oil at a consistent rate of 3,000 barrels a day. By digging deeper in Nos. 2 and 4, oil came in at similar rates. All through the year, the crude was suddenly flowing thick and fast in the Arabian heat, and Standard Oil was finally convinced that it had struck pay dirt. Early in 1939, Ibn Saud and the nation of Saudi Arabia received its first royalty check at a rate of 21 cents per barrel, and soon after, the first shipment of Saudi oil was loaded in a tanker and headed for the United States. Damman Dome was the first of more than 50 oil fields begun by Aramco in Saudi Arabia, where, in time, more than a quarter of the world’s known oil reserves would be found. Damman Dome was not the largest field in the region, on land or sea, but it was where the saga of U.S. involvement in Middle East oil all began; and No. 7 would produce at a consistent rate of around 3,000 barrels of oil a day until 1982, almost 45 years. Not long after that first shipment of oil sailed for the States, Fred Davies followed it home. Back in California he was rewarded for his stellar work in Saudi Arabia by being named president of the Arabian arm of Socal. He held that post for the next seven years, overseeing the continued expansion of operations in Saudi Arabia. Aramco was formed in the late 1940s out of a joining of Socal, Texaco, Exxon, and Mobil. At the time, Davies was asked to step aside from the presidency, which went to a Texaco man. Davies, “a good soldier,” in the words of one co-worker, became vice president in charge of operations for Aramco and in 1949 moved back to Dhahran in Saudi Arabia with his wife, Amy, where the two would spend the rest of Davies’s career. 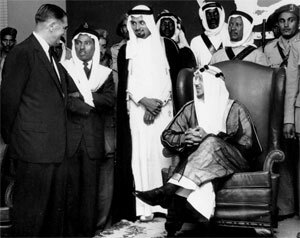 In 1952, the headquarters for Aramco were moved to Saudi Arabia, and Davies, already there and in charge of operations, was named chairman of the board and CEO. 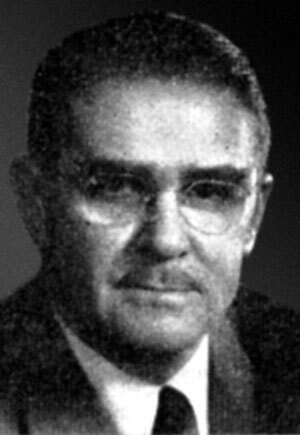 Along with the Texaco executive, who remained president of Aramco, Davies worked as a co–chief officer until his retirement in 1959. 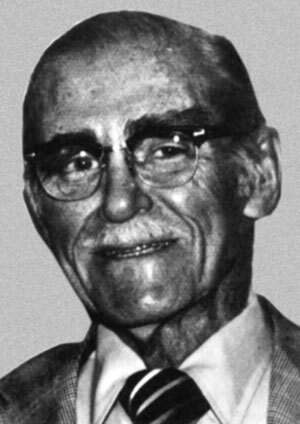 The University of Minnesota honored Fred Davies in 1954 with an Outstanding Achievement Award for his professional accomplishments. Six years later, the U recognized Fred’s brother Herman, also a U of M grad (B.S. ’21), and also a long-time employee of Socal, with the same honor. Davies died in Lafayette, California on February 3, 1975. He was 80 years old. Amy had passed away six years earlier. They had two children who survived them, Fred M. Davies and Mary Davies Robbins. Tim Brady is a St. Paul writer and frequent contributor to Minnesota.